The release of USAopoly's World of Warcraft Monopoly is just around the corner, so let's take an exclusive look at what's on the most expensive corner of the game board. I showed you the money; I showed you what was in the cards. Now it's time to show you the priciest bits of real estate on Azeroth. 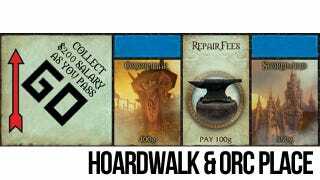 No big surprise that Park Place and Boardwalk, the most coveted bits of the standard Monopoly board, would be substituted here for the Alliance capital of Stormwind and Horde capital of Orgrimmar. I was really pulling for Gnomeregan, but them's the break. Hopefully the irradiated Gnome city will show up in its proper green spot. The only thing that could make these two pieces of property more expensive? Houses and hotels, or in this case, taverns and towers. Way to maintain the alliteration! Gives it that real Monopoly feel. So now we know which properties to aim for, all that's left is to wait for the game to drop later this spring.